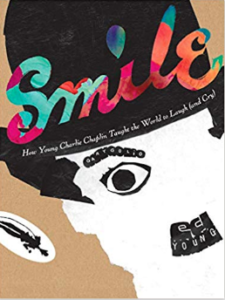 Esteemed Caldecott-winning illustrator Ed Young has teamed up with Gary Golio to put out SMILE: HOW YOUNG CHARLIE CHAPLIN TAUGHT THE WORLD TO LAUGH (AND CRY). SMILE published on March 26, 2019 with Candlewick to great reviews. An award-winning author and a Caldecott Medalist take a creative look at the early life of comedic genius Charlie Chaplin. His dad gone and his mother ailing, five-year-old Charlie found himself onstage, knowing only that funny and sad go hand-in-hand. With a lyrical text and exquisite collage imagery, Gary Golio and Ed Young interpret Charlie Chaplin’s path from his childhood through his beginnings in silent film and the creation of his iconic Little Tramp. You can purchase this fun, colorful masterpiece from these retailers: Amazon, Penguin Random House, and Barnes & Noble. Visit Ed’s website for more information on his art and career!